This vintage doll was a gift from my Fabulous Aunt to our sweet little grand daughters and their favorite toy at my house. No matter what she is wearing, they must change her clothes immediately upon their arrival. If you'd like to join in the Craft Room De-Stash Challenge, you can request to join our Facebook group here! 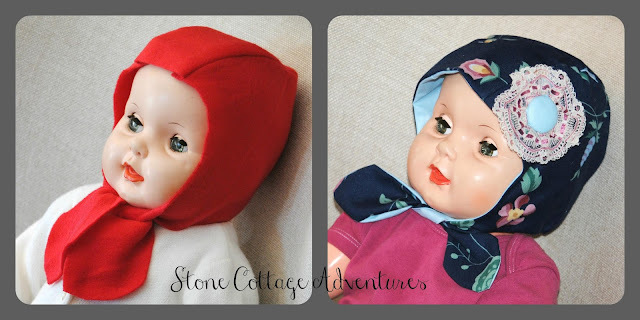 Sewing for the vintage doll is fun, but a bit of a challenge. She was made in the late 1960's so finding patterns just for her has not been successful. I've been using baby patterns, sewing a muslin, and then figuring out size from there. To see her winter ensemble (and January De Stash Challenge) just click HERE. Today, we are talking about accessories, specifically, her hat. 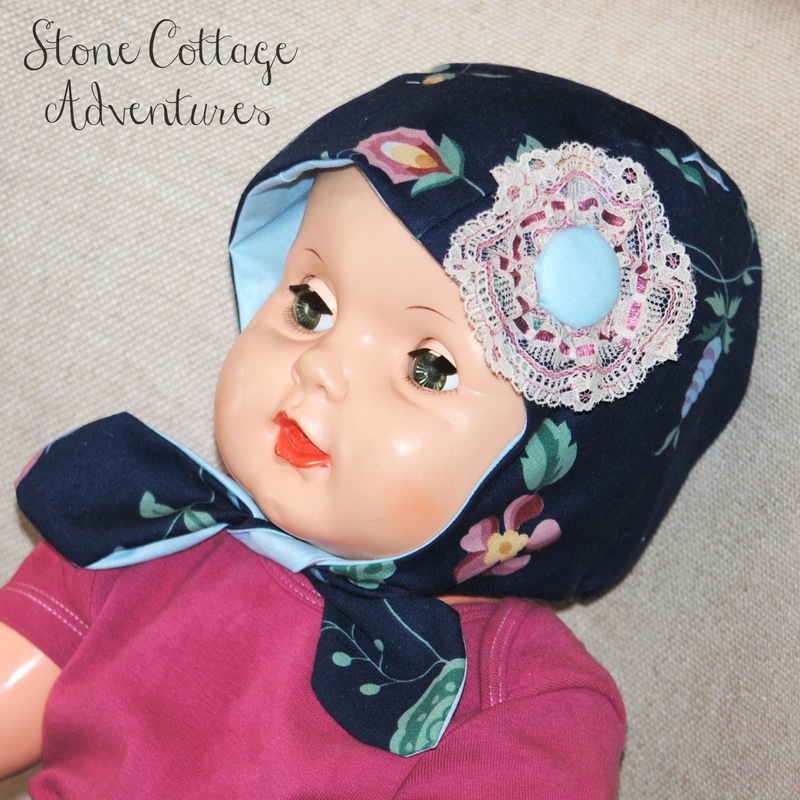 First of all, I found a *FREE* pattern for a Winter Baby Bonnet that is adorable! The muslin was made from red fleece as it doesn't need to be hemmed or lined AND it perfectly matches her Winter Ensemble that already has a cape and shoes sewn from the same fabric. I love how the soft red fleece drapes so nicely. Our vintage baby needs a 3 - 6 month size in this pattern. Moving on to what I really wanted to make in this floral navy with pale blue lining. You can see the cloth is quite a bit stiffer as the scarf becomes more of a bow. A darling little rosette was added to one side. It was made by hot gluing gathered lace around the underside of a covered button. Her spring outfit in raspberry and navy isn't quite finished yet. I am excited to show it to you soon! Everything from both hats was already in my crazy pile of a stash. Let's see what the other participants used! Your baby doll hat is adorable. Good job! How cute, Marci. 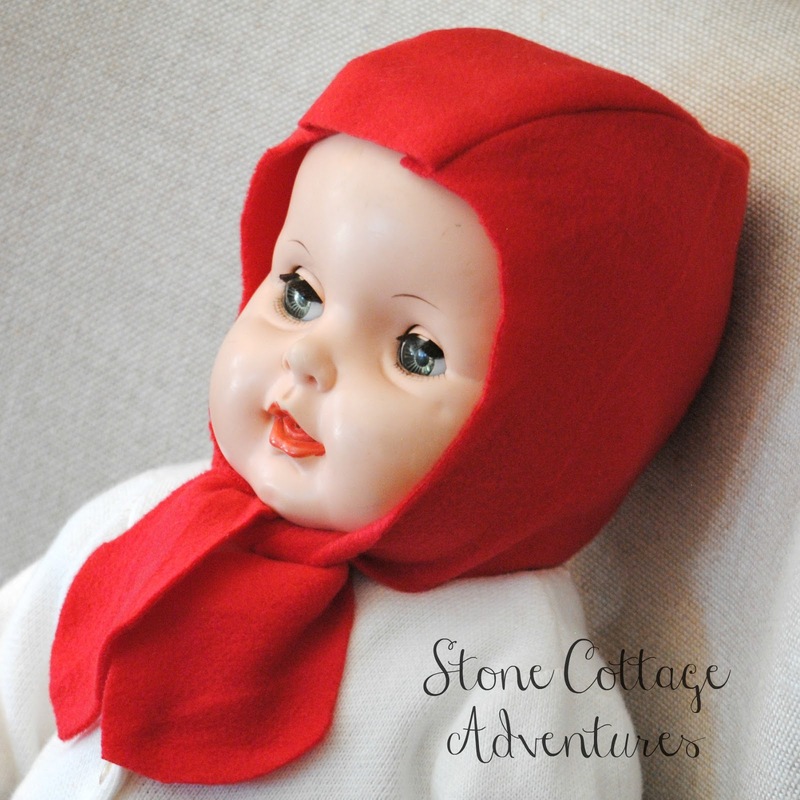 I'm sure your granddaughter loves the bonnet for her doll. I love love love the fact that you are sewing for this baby doll. Your granddaughters are very lucky to have such a creative nanna. Sounds like you are having too much fun making doll clothes for your grand daughters favorite toy, Marci! They're all so sweet! The floral bonnet is adorable. 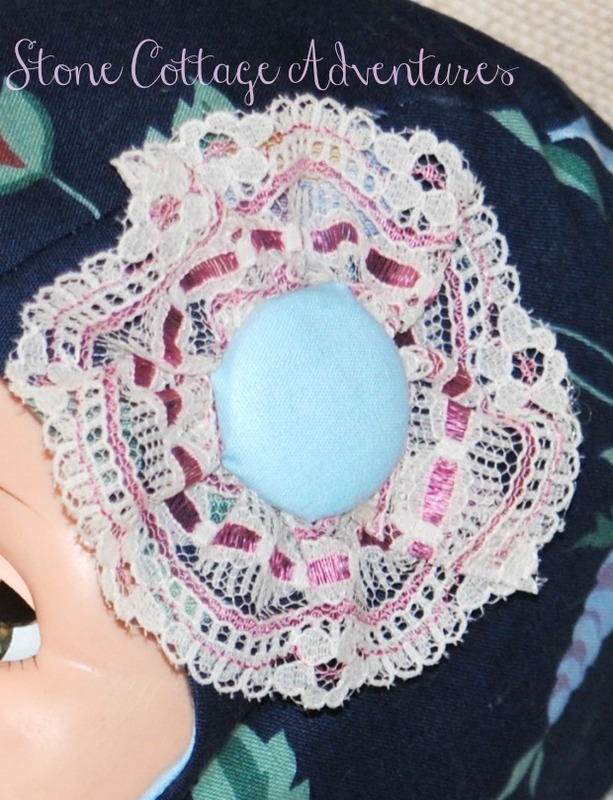 I love the lacy rosette. What a fun memory you are making for your granddaughters! So cute. I'm sure your granddaughters will treasure these when they are older. This is so sweet, it makes me miss the days my girls played with their dolls and always wanted me to make them new clothes! Tuesdays with a Twist - link party time! Let's Party! Tuesdays with a Twist.